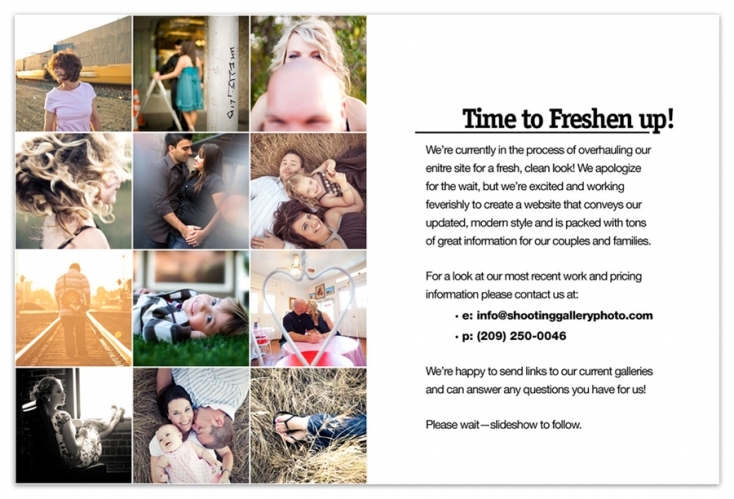 Modesto Wedding Photography |Time to Freshen Up! We’re currently in the process of overhauling our entire site for a fresh, clean look! We apologize for the wait, but we’re excited and working feverishly to create a website that conveys our updated, modern style and is packed with tonsof great information for our couples and families. For a look at our most recent work and pricing information please see our Contact page. We’re happy to send links to our current galleries and can answer any questions you have for us! Hi, I’m getting married on Oct. 10th of this year, and I was looking for a photographer, and I have some friends who recommended you guys to us. I was interesting in you’re pricing on packages and also engagment photos too. Thank you.